A suicide bomber killed at least 29 people near a polling station yesterday as Pakistanis voted in a knife-edge general election pitting cricket hero Imran Khan against the party of jailed ex-prime minister Nawaz Sharif. The Isil militant group claimed responsibility for the attack, which officials said killed 29 and wounded 35 in the western city of Quetta. Security sources said the bomber drove his motorcycle into a police vehicle. About 106 million people are registered to vote, with the result expected early today. Sharif’s party called for voting to be extended by an hour, saying people were still lining up and could be turned away without voting. Local TV channels said officials denied the request. Khan has emerged as a slight favourite in opinion polls, but the divisive race was likely to come down to Punjab, the country’s most populous province, where Sharif’s party has clung to its lead in recent surveys. 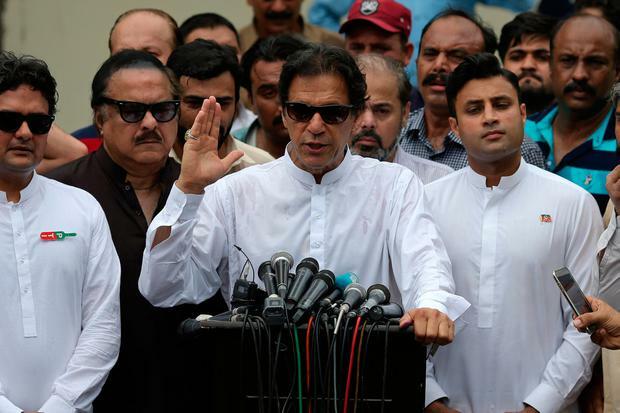 The election has been plagued by allegations the armed forces have been trying to tilt the race in Khan’s favour after falling out with the outgoing ruling party of Sharif, who was jailed on corruption charges. “Imran Khan is the only hope to change the destiny of our country. We are here to support him in his fight against corruption,” said Tufail Aziz (31) after casting his ballot in the north-western city of Peshawar. Whichever party wins, it will face a mounting and urgent in-tray, from a brewing economic crisis to worsening relations with on-off ally the United States to water shortages. An anti-corruption crusader, Khan has promised an “Islamic welfare state” and cast his populist campaign as a battle to topple a predatory political elite hindering development in the impoverished mostly Muslim nation of 208 million.